I could really go off on how repulsive Donald Trump has been long before this weekend’s sexual assault promo tape. His statements and actions around Muslims, immigrants, the Central Park Five, Syrian refugees, the freedom of the press, [ad infinitum] are horrible. He is horrible. But somehow this woman wasn’t turned off by ANY of that. Because the things that are “obvious” to many of us simply are not for many others. The transgressions that seem irredeemable to us are invisible to them. This is frustrating, and it gets worse. 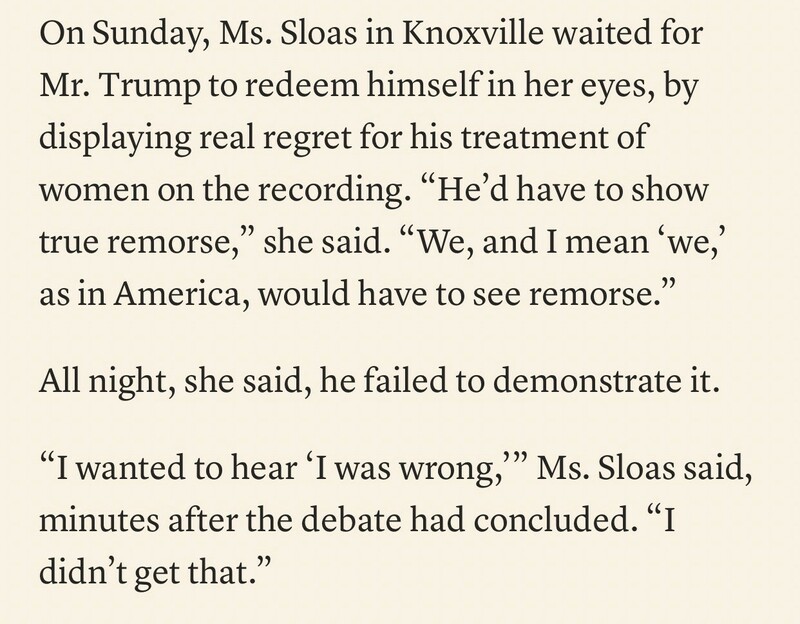 See her second quote when she makes clear she really would have stuck with Trump had he merely shown remorse. All she wanted from him was a modicum of pretend humanity, and he could not do that. What does it say about her and about all of us that she was so eager to offer a second chance? That she was so biased in favor of his redemption and success? Would that people like her, indeed all people, were so desperately and proactively prepared to offer forgiveness. However, the millions bound by our criminal justice system remind us such is not the case. Would that the Syrian refugee or the black teenager or the Latin American migrant worker were granted such benefits of the doubt. I want to live in that world. The sadness of the case is not really about Donald Trump and his ugliness. It’s about all the people who are better than Trump who will fail because Trump and people like him have been granted undeserved success at the expense of us all. So I return to this voter. How do we treat people like this voter? How do we consider her and talk about her and address her? Contempt and ridicule are easy and satisfying. Patience and compassion are difficult, yet I suspect it’s the latter that will more likely create the better world I describe above. And it’s that realization. That humbling realization of the size of the love required to embrace someone who feels so far away has me feeling exhausted and honestly not quite up to the task. I guess that’s why they call it the high road. It takes more effort to climb.